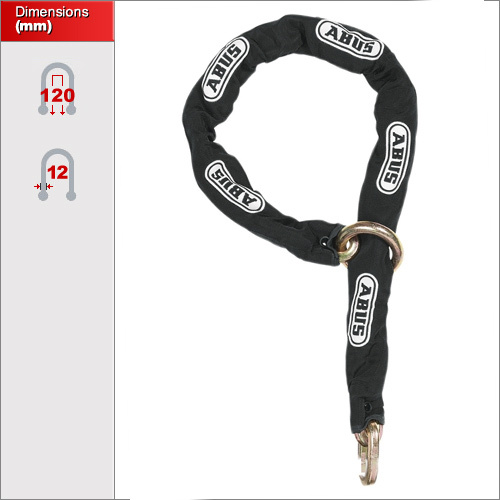 The 12ks loop is similar to that of our standard steel chains but this version comes with a large steel ring at the end. 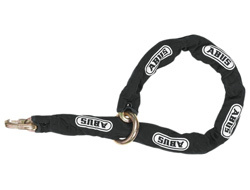 This basically allows you to thread one end of the chain through the ring and extend it to the padlock. This is expecially useful when using a disk lock or some other locking mechnism to fix a bike to a ground anchor as seen below. It has a fabirc sleeve to prevent the chain from scuffing paint work and each link is 12mm thick graded hardened steel. Note that this video review is for the WBA Ground Anchor but it does show the 12ks loop. This chain is design to thread through the loop and then onto the lock. Only one link will ever go onto the lock so it will fit many closed shackle designs.